Bean bag chairs aren’t just for the kid’s rec room. They are more popular than ever before, and your hotel or resort is missing out if you don’t cash in on this popular, economical and fun choice of furniture for your establishment. It’s hard in today’s hospitality industry to set yourself apart from the competition. Bean bag chairs are a great way to make yourself stand out. There are more than 17 million rooms available around the world. That’s not even counting the whole Airbnb phenomenon. You need something unique to make yours the one potential guests choose. Now you not only have traditional hotels or resorts to compete with but the comforts and diversity of homes around the world too. Offering support, fun and exciting decor is a must to be competitive in today’s hospitality industry. Check out these seven unusual ways to use bean bags chairs at your hotel or resort. People love to stay in unique and exciting rooms. Many places concentrate on the bed and television but don’t put nearly enough thought into the chairs and furniture that make up the rest of the decor. How many times have you gone into a hotel room and found chairs that were almost unbearable to sit in? Bean bag loungers and chairs can solve that issue by offering your guests a comfortable and stylish option to relax between check-in and bedtime. You don’t have to limit it to chairs though. End tables and coffee tables are often boring standard wood designs or made of glass. These can easily be chipped or broken by guests placing their bulky luggage on top of them, standing or falling on them. Why not use bean bag ottomans as your accent tables for the room? They can offer an extra place to sit or have things set on them without worrying about collateral damage happening. 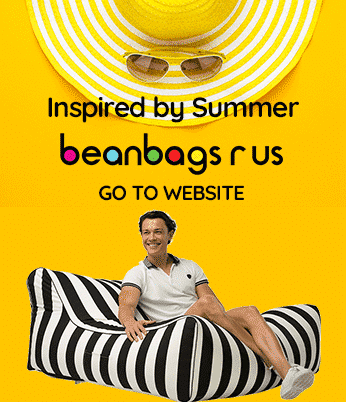 There isn’t a more luxurious way to catch some rays of sun than floating around on a pool bean bag. These are much more durable and versatile than the usual blow up options most hotels go with. You can wow your guests with these colourful and comfortable options for lounging on the water. Parents can lounge in the pool as their kids splash around playing. Teens can work on their tan while texting their friends back home. Young children can feel like they’re a part of the action without struggling in the deep end by floating around on these awesome additions to your pool accessories. It doesn’t take much to stand out from the rest of your competition and be remembered for the lush pool setting you created with small additions like floating bean bag lounges and chairs. You can turn your outdoor recreation and relaxation areas into an oasis with the comfort of outdoor bean bag furniture. It’s not only trendy and comfortable, but it’s super durable and will brighten up any area. Whether you’re looking to personalise a patio area or want to add some character to a grassy area outside your establishment outdoor bean bag chairs can turn a plain backyard space into a gathering spot for guests of all ages. It’s simple to change up the decor of your outdoor spaces with outdoor bean bag furniture made to endure the wear and tear of the elements and guests of all ages using them. You can spruce up the front of your establishment by giving guests a comfortable place to wait for their transportation to arrive or as they decide where they’re going to explore for the day. Decks and patios for individual rooms or in common areas will turn into beautiful and comfortable places to hang out with inviting bean bag chairs and lounges for everyone to enjoy. Book lovers search for sites that feed their passion and having a plush, and the comfortable reading room could attract a whole new clientele. 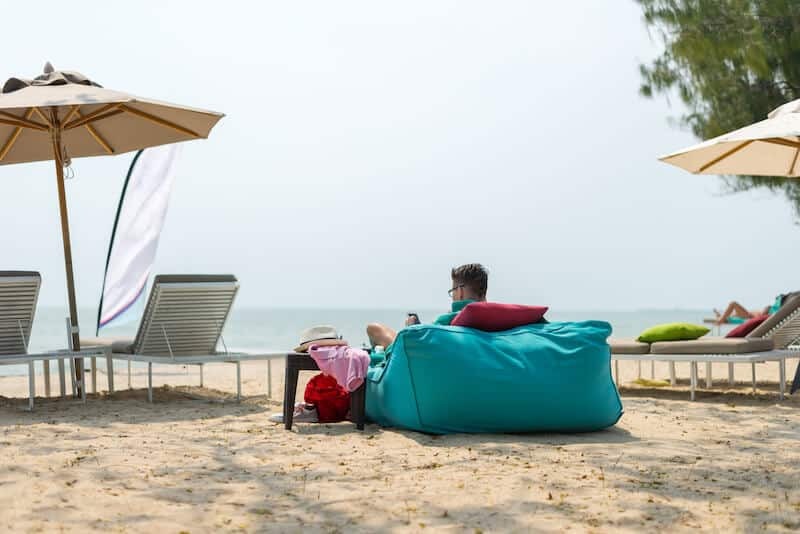 Whether you are creating a reading room within your resort or hotel or you want to join the worldwide trend of beach libraries, bean bag chairs and lounges could be the perfect place for guests to lay back and enjoy their favourite books. Reading rooms are all the rage and have begun to garner a lot of attention online as travel bloggers focus on the unique and beautiful spaces dedicated to books and book lovers around the world. Instagram, Pinterest, Facebook and more are filled with pictures of libraries and reading rooms worth seeing. It’s a great way to get free advertising online and to entice guests to relax and unplug from the internet for a while. More people are travelling with man’s best friend and seek out hotels or resorts that cater to their furry pals too. Dog bean bag beds are an awesome way to give your four-legged guests a space of their own that’s welcoming and comfortable. These beds are water resistant making them easy for housekeeping staff to maintain and super comfortable for dogs or cats to snooze away as their people enjoy the rest of your facility. You may even want to add a doggie spa or outdoor play area geared towards dogs. Fenced in kennels or running areas can offer safety and convenience as guests exercise and play with their furry travel companions. Add a couple of dog bean bag beds to your outdoor areas too, with a leash spike to allow guests to tie their pet by the pool or outdoor lounge while they swim, catch some rays or sit and visit with other guests. A perfect addition to any hotel or resort is a recreation or games room, mainly if they cater to families with children. Creating an impressive games room may require a bit of an investment but can have huge returns as families plan their vacation searching for someplace that will keep their kiddies entertained. Comfy kids bean bag chairs are the perfect accessory to any games or recreation room and will allow kids to hang out in comfort as they wait for their next turn at the video or table games you offer. But kids aren’t the only ones who love to have fun. You could design a recreation room geared towards Millennials as well. From escape rooms to retro video game rooms millennials love to make the most of their downtime. These are not only great options for families and millennials but companies as well. Many bosses recognise the need to mix business and pleasure to get their employees to perform at and be their best. You could open up your resort or hotel to a whole new line of clientele by offering team building and recreational events for business retreats and conventions. Your lobby is one of the first places guests see and can leave a lasting impression. Especially if they are walking into it for the first time. Potential guests can fall in love with your establishment or be completely turned off by the feel of your lobby. It’s vital that your lobby is welcoming and inviting. Many hotels or resorts try to impress with strong and expensive looking accents to the lobby but it does little to make guests feel comfortable or like this is a place they can have fun and enjoy themselves. Uncomfortable furniture does little to calm guests waiting for a problem to be fixed or looking over their bill. After travelling a long distance, the last thing they want is some hard chair to sit in while they wait for check-in time. Bean bag chairs and lounges in your lobby can offer a comfortable place to wait, be inviting for guests of all ages and help your visitors feel welcome and excited to see the rest of your facilities. Children and teens are often less than thrilled to stay someplace besides home. They want to have entertainment and toys and will find lots to complain about if they don’t think that’s possible where they are. You can win them over before they even see their room with a lobby that suggests fun and comfort for them. Bean bag chairs are the perfect choice for any area of a hotel or resort because it’s hard to sit in one without smiling. There are tons of options available of varying sizes, shapes and purposes. You can make your hotel or resort stand out from the rest and become a favourite for your guests of all ages by adding bean bag chairs to your decor. Contact us today for help choosing the right bean bag chairs for your guests.